I was very much in the mood for some mulled wine today when I got home from work. When I left this morning just before 9AM, the grass in the centre divider was crispy with frost – not anywhere near as cold as it might be elsewhere in North America at the moment, but the temperatures are definitely dropping around here. They’ve eventhreatened snow this coming week. In a pan on medium heat: a cheap bottle of red wine, a sliced navel orange, two sticks of cinnamon, a half dozen cloves, about the same amount of allspice brought to a simmer, then some cane sugar and a splash of brandy was added – it simmered some more until it was reduced and sweet. Delicious! Meanwhile, I was researching recipes in which to incorporate pomegranate. I’m plotting my dinner menu for a mid-December meal that I will host at my home and pomegranate has been speaking to me to be incorporated, though I haven’t cooked much with it. I went to the Christmas Market at Jack London Square after work one evening last week and discovered Provence en Couleur‘s booth. They had wonderful sachets of herbes de Provence so I decided to incorporate some into today’s experiment. 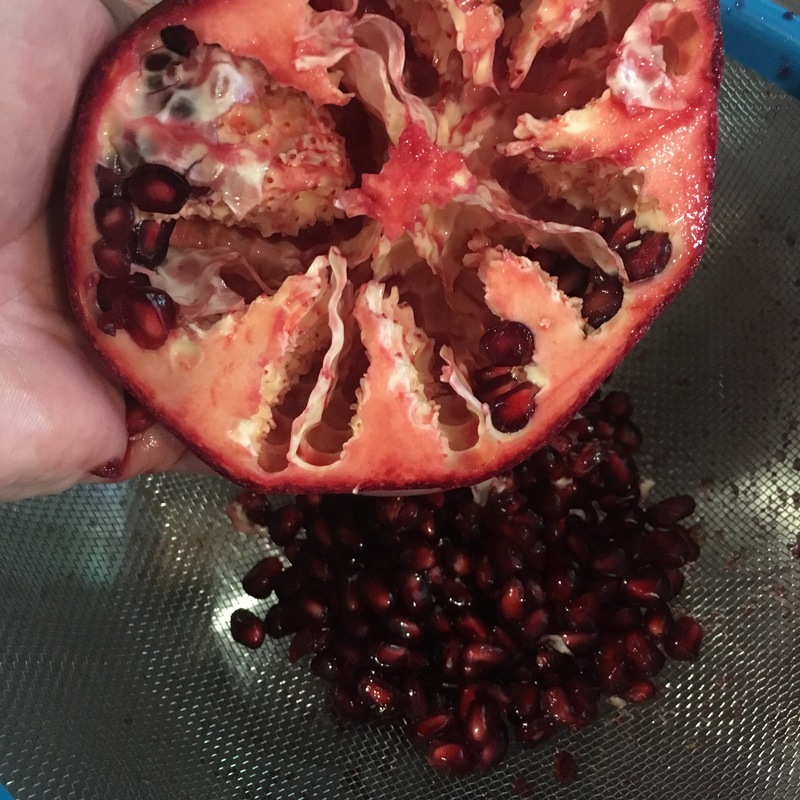 I deseeded a pomegranate (which was much easier to do than I thought – check out this video) and after saving a handful of seeds for later, I expressed the juice from the rest by placing them all in a sieve and pressing down on them with a spoon. I cleaned, peeled and sliced 4 small yams and placed them in a large ceramic baking dish. I added peeled and quartered shallots and a half dozen garlic cloves (still in their skin but crushed with the broad side of a kitchen knife). A little grape seed oil was drizzled over the top and the whole thing was tossed and spread out evenly in the dish. A layer of fresh poultry herb mix was laid over the top of the veggies in wait for the chicken. Next I spatchcocked the chicken. 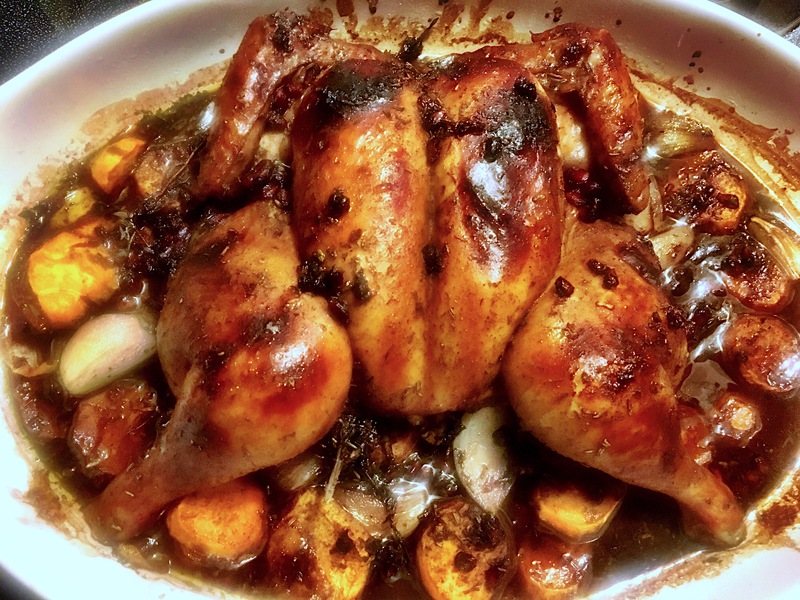 Essentially, you flip the chicken on its breast and cut along either side of the spine with kitchen shears so that you can open up and flatten out the chicken. I rubbed a bit of grape seed oil on it and sprinkled it with some grey sea salt. Then came the making of the pomegranate sauce. I used the expressed pomegranate juice and squeezed a navel orange (it came to 1 cup liquid) and put it into a sauce pan on medium to bring to a simmer. I let it simmer for about 10-15 minutes and then added 1/4 cup cane sugar and a tablespoon of black treacle. Once that incorporated, I gave it a splash of chocolate raspberry port and added 1 cup of chicken broth. 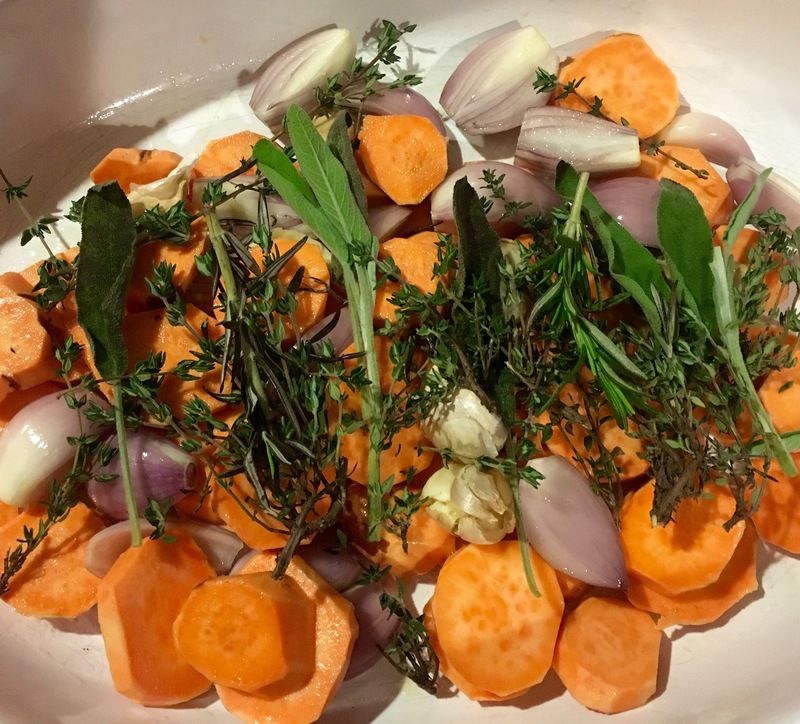 I let this reduce a bit and then added a spice mixture: grey sea salt, freshly ground black pepper, smoked paprika, ground cinnamon and cloves, and finally Eric’s lovely herbes de Provence, simmering it all together until all of the flavours melded. 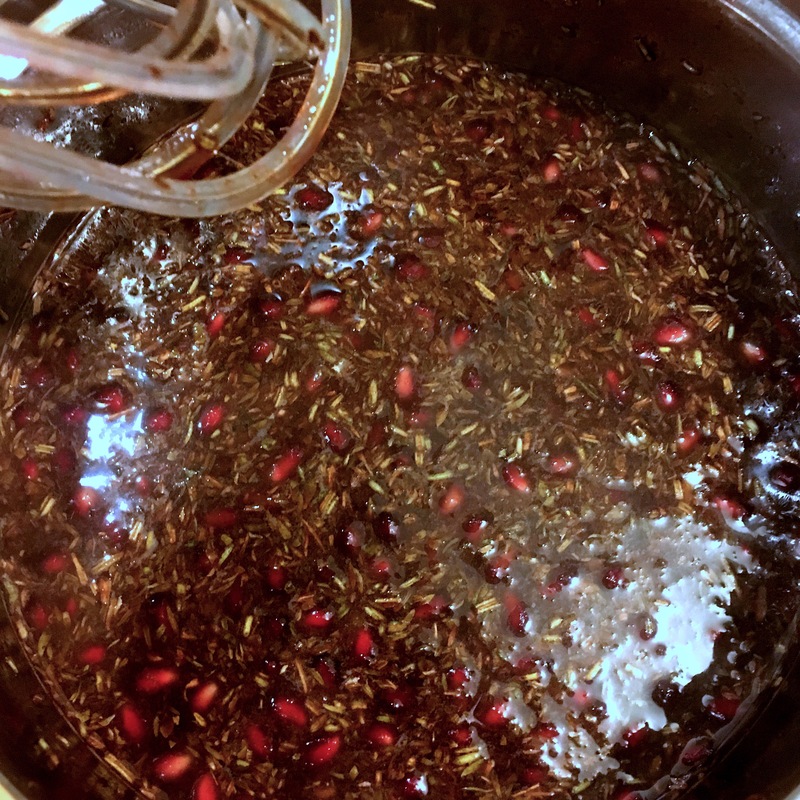 I added the reserved pomegranate seeds to the mixture. Once the sauce cooled a bit, I poured it over the chicken and veggies and put the dish into the preheated 400F oven for an hour. It was basted several times throughout the roasting time. 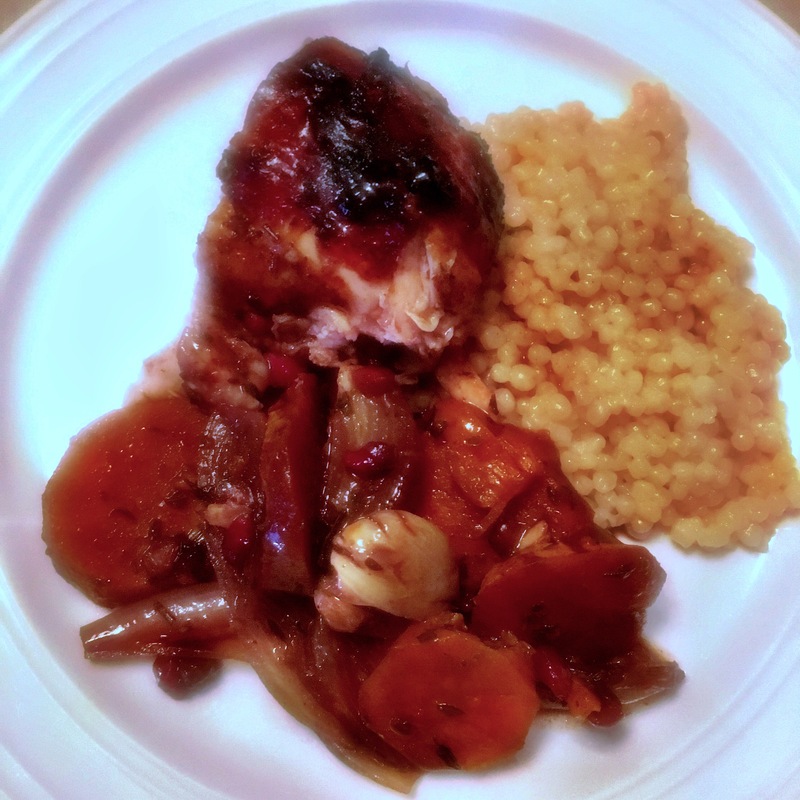 The dish was served with some pearl couscous. Yum! 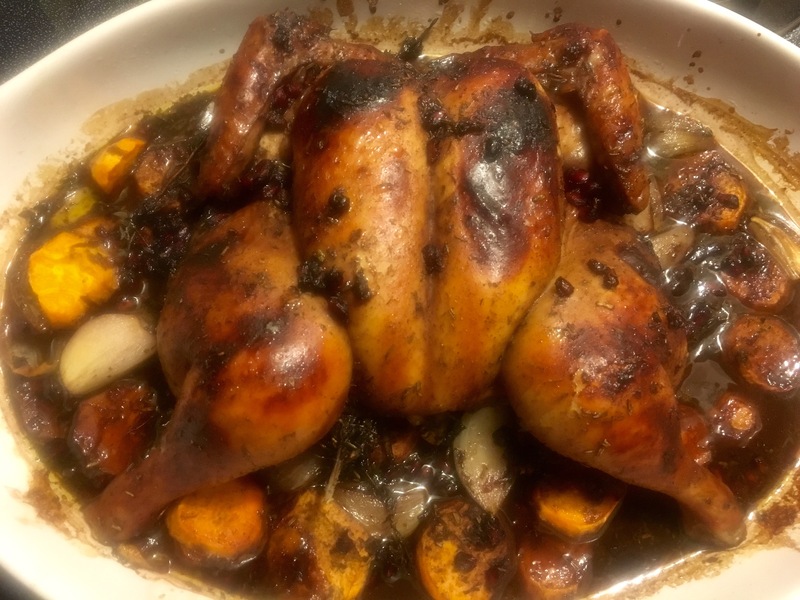 This entry was posted in from my kitchen, I MADE THIS, LIVING OUT LOUD and tagged chicken, mulled wine, pomegranate, recipes on 4 . December . 2016 by theartsyfartsychick.